During the American Revolution, five students at the College of William & Mary founded Phi Beta Kappa. They believed that a new nation required new institutions – cultural as well as political – and they were committed to intellectual fellowship shaped by the values of personal freedom, scientific inquiry, liberty of conscience, and creative endeavor. Their legacy, more than 240 years later, inspires today’s students to pursue these same values through a 21st century education in the liberal arts and sciences. Phi Beta Kappa's first meeting took place on December 5, 1776 in the Apollo Room of the Raleigh Tavern in Williamsburg, Virginia. At a time of political and social turmoil, the organization’s founders envisioned a secret society that would give members the freedom to discuss any topic they chose. Ever since, freedom of inquiry and expression have served as hallmarks of ΦBK. John Heath (pictured left), the first president of Phi Beta Kappa, was determined to create a serious-minded student society that would offer more than the opportunities to socialize that other college societies were known for at the time. The first collegiate society identified with a Greek letter name, ΦBK introduced the essential characteristics of others that followed it: an oath of secrecy, a badge, mottoes in Greek and Latin, a code of laws, an elaborate form of initiation, a seal, and a special handshake. In the winter of 1781, when General Charles Cornwallis positioned the British army on the York peninsula for what became the climactic siege of the American Revolutionary War, the College of William and Mary closed. This closure might have ended ΦBK, but for the vision of their only non-Virginian member, Elisha Parmele, who persuaded fellow members to allow chapters to be chartered in New England. A native of Connecticut who had studied at Yale and graduated from Harvard, Parmele helped to create chapters at Yale in 1780 and Harvard in 1781, ensuring the continuation of the society. In 1831, after anti-Masonic agitation prompted much discussion about the ΦBK oath, Harvard's chapter dropped the requirement for secrecy, an action that probably saved the society from further criticism as well as from rivalry with the social fraternities that made their appearance around that time. Phi Beta Kappa added other chapters gradually. With 25 chapters in 1883, they created the National Council of the United Chapters of Phi Beta Kappa. At about the same time, the Society invited the first women and African Americans to join ΦBK. The first chapters to induct women were at the University of Vermont in 1875, and at Connecticut’s Wesleyan University, in 1876. The first African Americans were elected at Yale, in 1874, and at the University of Vermont, in 1877. Between 1887 and 1917, the Society established 64 new chapters. By 1983, it had chartered another 147. In 1988, the national organization changed its name to "The Phi Beta Kappa Society." Today there are 286 chapters at American colleges and universities and 50 active alumni associations located in all regions of the country. Source: Richard N. Current, Phi Beta Kappa in American Life: The First Two Hundred Years (Oxford University Press, 1990). Phi Beta Kappa’s name originated from the motto "Love of learning is the guide of life," a phrase the founders derived from the Greek Φιλοσοφία Βίου Κυβερνήτης. The three Greek letters ΦΒΚ are inscribed on the signature gold key that is today a nationally recognized credential signifying academic achievement. 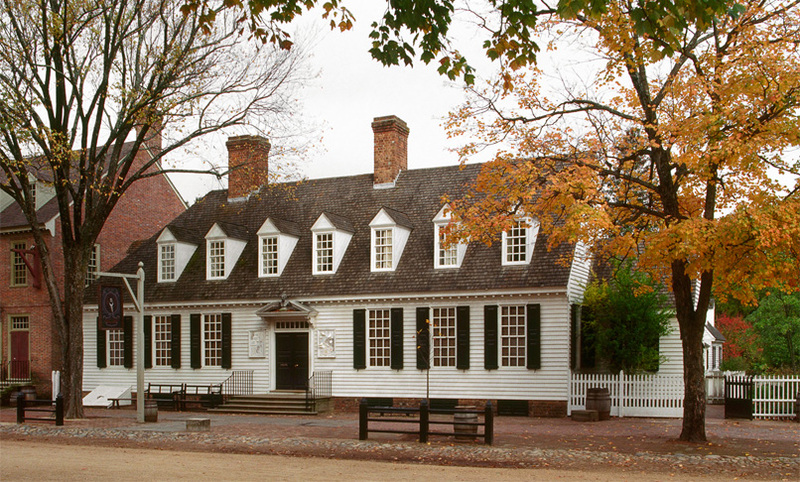 Reconstruction of the Raleigh Tavern in Colonial Williamsburg, Virginia, the birthplace of Phi Beta Kappa.